not sure if it is the same as I had last week or something else but I seem to be prone to the tummy bug that is doing the rounds. Just spoken to my Dad and he says that Mum has it as well. I got sent home with it yesterday and rested up today although did have some fun with Ryan on Wii Sports Resort. I like the Wakeboarding and Frisbee games best. Playing that really cheered me up as I have felt a bit down because of the tummy bug. Going to have a go at Wii Fit again in a minute. Handed in my notice on Monday too. Being ill has not helped the cause but I am looking forward to the new job as it is a new challenge that I will relish. I have also made a decision about being more positive about things. I have had a lot of time to think while I have been off and I just wish that I had thought about it sooner. I have decided that I need to rid myself of anything that is causing a negative reaction in my life. That includes spending less time on the PC, more time doing the things I should be doing in the way of housework, spending time with the kids and Tim and making sure that there is nothing that will cause any hassles like alcohol and unwanted friends around. It also means that there will be a more positive bearing on the way I do things in general like to do with the bank and things like that. Sometimes when things have got on top of me all I have wanted to do is cry. I need to stop that and only cry when I need to for a reason. Though saying that this tummy bug has brought tears to my eyes a few times. as a holiday a total disaster. A weekend in Southend, a day in Southampton and a day in Swanage because I felt so rough was all we managed to do. Saying that we did get out and fly today. Well Tim did. I just sat there and watched. Talked to a few people about flying and what the local area is like. Or more to the point the lack of local flying sites. I wish there were more but as Baiter is the only one I guess we will have to make do with that and the odd trip to Westward Ho! for now. Feeling a bit rough still but nothing like as bad as earlier in the week. Stomach still twinges from time to time but is not too bad now. I can eat better now as long as I am careful. Fizzy drinks and bland food seem to be working. Not sure how it will affect my weight but will find out tomorrow night. 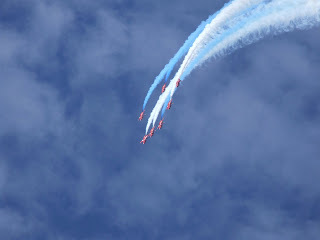 Went to Swanage yesterday and sat on the cliffs at Peverell Point watching the Red Arrows. OMG they are amazing. Because of where we were stood they seemed to come so close to us. One of them flew over and it was almost as if you could touch it as it seemed so close. I also got some very nice pictures of them which will be on my website shortly. We took a picnic and had a lovely time. I felt a whole lot better than I did the rest of the week and the fresh air did me good. It was nice sitting out in the sunshine and the clouds covered the sun at just the right time to take pictures. Back to work tomorrow. Need to speak to the boss about my new job and advise that I will be finishing on 07 August. I knew that something would have to be done about another job as this was due to finish in April anyway but I actually feel quite sad about it as there was less stress in this job than any I have done in the last ten years. Oh well things happen and its time to move on even if it is sooner than I expected it to be. it got so bad I went to the doctor this morning who said its gastroenteritis. No wonder I have been in so much pain……………bland food for the next few days for me then though made a mistake and ate some grapes earlier which was not a wise move at all. On the plus side this week as the majority of it has been a disaster I have been offered and have accepted a new permanent job with the department of Work and Pensions as a benefit advisor in the local call centre. Its good money and I should be able to work more or less the same hours as I am now, give or take half an hour. I will miss the people that I am working with now though. I have come to like them a lot and they are just a lively team to work with. I still have to tell the boss at the agency and also the boss at where I am but that can wait til I go back on Monday. Not much else to tell due to not really being able to do anything. Well been to Southend instead of Eastbourne. Very little rain (less than here by all accounts) and very gusty wind meant very little flying done. But we had fun and ended up sat around a bonfire on Saturday night. Only thing that I forgot to pack was the gas lighter for the hob and had to use matches which I hate. It was nice to get away just the two of us. There were not many people at the event due to the wind but we still had a good time. We are on holiday this week. Stands to reason that it rained all day today. Went to the new Ikea in Southampton yesterday. What a store and how reasonably priced are they? I could have spent a fortune and yet spent about a tenner all told. Got some tea cups and saucers that are bigger than tea mugs for less than £3.00 each set. They have a small food hall in there too which had some really nice things in if only we could have gone straight home. Had to get the kids from Paultons Park on the way back. Today we had big trouble with the front door and had to call someone out to fix it. We have had it about three years and the whole of the lock mechanism has gone on it. The people we got it from have done a temporary fix and will source the full lock in order to fix it properly. I have also been ill again. Not content with a throat bug over the last couple of weeks I now have the stomach ache from hell. Not sure what I have eaten (except a Subway type roll in West Quay yesterday) that could have caused it. So the only place I have been today is H2O for Kristie’s new harness and Sainsburys for Eggs and bread. Think I will have an early night though. Not sure what we are doing for the rest of the week. Hope to go flying tomorrow……………if it ever stops raining……………. written anything since Tuesday? I can’t believe it is that long ago since I wrote. But then that could be because not a lot has really happened since then. Had a review at work and got what is considered to be an above average grade for a ‘new starter’. I was very happy with that especially as I thought that I was sort of just on average even though I like stuff I can get my teeth into and seem to be getting more of that now. I seem to pick things up very easily with this job which is why I feel less stressed than in previous jobs. I know it is going to come to an end one day. Hopefully not for a while yet though. I have started to think about the Summer holidays now that they are only a week away and what the kids are doing. We are off the first week and going to Southend (just me and him) next weekend and then not sure what we are doing the rest of the week. I am looking for inexpensive places to go that we have never been to. A lot is weather dependent. I am also going to delegate tasks to them to do each day regardless, no excuses for not doing them. I am also going to encourage Ryan to keep a diary of what he does over the holidays which for some reason this year are a week longer than normal. Watched the Speedway on TV earlier. The Russians beating the Danes and the Swedes was a real turn up for the books and does not really bode well for our chances if we make the play offs on Thursday. If they carry on the way they are I can see the Russians winning the whole event. I am also starting to enjoy Facebook a bit more now I understand a bit more about it. I now have 6 friends and it feel that it is also helping with my issues over depression and other things. I am not getting involved in some of the games and stuff but do play Bejewelled Blitz sometimes. Not got a very high score compared to the rest of my friends though. Today has been a good day………. Well apart from being disturbed early by Tim when he went out. But then I never sleep properly after he goes on anyway. I felt good compared to what I normally do when he goes off to Willersey and it lasted all day……………more or less. I did a risotto with Spinach in for dinner as Tim got given some at work today. It was very Slimming World friendly and worth it. Just a bit too salty for my taste. I am trying to be more radical in the way I do food. Tomorrow we will have a salad to use up what is in the fridge. Not sure what with yet but it will be good what ever it is. Its been a good day at work. Yesterday I struggled but today I excelled myself by going above and beyond the call of duty with the work I did. Boss says I could be out a grade ahead if I keep this up for the next few weeks. That would mean being involved in the more complex stuff. I want something to get my teeth into. Dreamed about going away last night and for some reason we ended up in of all places Hamburg. Now I have only been there once in 1983 and can remember walking round town and knowing where I was going despite the fact I had never been there before. I have had that about a few places we have been to. Colchester and Cambridge being two that spring to mind. But then I have issues with Deja Vu anyway. Some days I feel as if I am going to fall apart. I have been not what I would call the perfect wife but a damn sight better than I have been and all I feel is lost and alone at times. I hate being criticised. I hate days where like today it has been hot and sticky and its given me a headache. My throat feels like the bottom of a bird cage and is very sore. Most of all I hate falling asleep in the car when we go out, but sometimes I can’t help it. May be its regression to being a baby and the need to sleep. I have days where I could fall asleep at my desk, I can fall asleep again within half an hour of getting up but can I sleep at night????????????? Not always though it has been better. What has not helped is it has been time of the month the last few days and that takes everything out of me. Sometimes all I want to do is cry. Its as if I don’t then this depression will not leave my system. Even when there is nothing wrong sometimes I feel like this. I feel I am becoming a better person. Its a long haul though. The alcohol has gone out the window and I live on diet coke and flavoured water. I am sort of mastering the art of Facebook. Can anyone tell me what Farm Town is though as I have received a gift and have to return one and don’t have a clue what it is about. I now have 5 friends on there. Its a good way of keeping in touch with people which is why I signed up. As they say its good to talk. I find it easier to talk in an email or text than face to face a lot of the time. Busy week for Ryan next week with two school trips, sports day and reports coming out. He is off to Monkeyworld (school have adopted a monkey and he has been selected for the visit) and Moors Valley Country Park with the ‘Calm Corner’ group. Bless him he had a better social life than I do………………. what with it being Jenna’s 18th today, it sort of took me back to when I was 18 nearly 30 years ago. We hired a skittle alley for my party and had meals in baskets and a small bar and about 30 guests. My mother did the sherry on arrival bit and we had a good laugh. One thing I have never forgotten is that we hired a mini bus to take everyone home as we lived in New Milton and everyone else lived in Poole. As Liz (who sadly passed away last year) was the last one to be dropped off, I decided that I would phone her the next day to make sure that everyone got home ok. She made me laugh when she said ‘That half bottle of sherry that your Mum gave to your Gran’ I replied ‘ummmmmmmmm yes?’ Liz carried on with ‘well not only did she finish it off but she started to sing dirty rugby songs as well’. Cue me thinking ‘oh my god what is she going to do next!!!!!!!!!!!!! !’ Nan swore blind she never sang (she never could anyway) and didn’t remember getting home. I miss my nan still as it has been 17 years since she passed on. She always used to make me smile and also used to get embarrassed going out with me because I was taller than her. It also made me think of the others we have lost since the kids came along. Uncle Ray, Uncle David, Auntie Vera, Jean and Geoff, and of course not forgetting Tim’s Dad. All of them missed in different ways. The heat is getting ridiculous. I am sat here almost naked because it is so hot. 27 c in the dining room and that is with a fan on and the windows open and the back door open. Need a thunderstorm to clear the air really. Will it happen is anyone’s guess. The intense heat seems to give me a permanent headache and occasional fuzzy vision. I can put up with that though. As long as the headache does not go in behind the eyes I will be fine. No Kristie tonight, she is staying at Caz’ house as she needs cheering up. Early night I hope. Facebook that is. I have signed up after debating it for ages and will be using it to keep in touch with friends and relations more than anything. have had a couple of silly conversations with my best friend and it seems quite good fun. Getting used to it though is another thing. Its been hotter than hell here. Or so it seems. Its been so hot today that it was cooler inside the building at work than it was outside. That was until the air con started to play up and be silly again and a couple of people nearly passed out. I hope Jenna is ok though. She is 18 tomorrow and was complaining of feeling rough earlier. Sounded a bit like tonsilitis which I hope it is not. She also had a huge bouqet of lilies delivered to her as an early birthday present today and the smell was amazing. Not much else to tell really. Been to hot to do anything any sense so have not really done much. My hip is still hurting but is not as bad as it was. Kids are ok as is him indoors. Need cold drink to keep going though……………….. Almost forgot this to do with Ryan and school. He came off statement 2 years ago and the procedures that were agreed were not put in place. To be honest I had forgotten about it until we saw Ryan’s consultant in May. However the school have now stated that they cannot understand why nothing was done about the procedures and are in the process of implimenting them. They will now make sure that Ryan has a lap top for year 5 and extra time for tests etc.